The Bermuda Regional starts tomorrow, and I'm red-eyeing it out tonight. This tournament is always the best one on the ACBL's schedule. The local organizers work with the country's tourism department to create a wonderful experience. I'll give you all the details next week (if I can find an internet connection). Partner, in first chair, opens 1C, and RHO bounces to 5S! What's your call? LHO opens 3C and RHO lifts to 5C. D0 you bid? For a warmup, here's a bidding and play problem faced by England's Phillip King (coauthor of The Kings' Tales and many other fabulously entertaining bridge books). His LHO opened 3H, and there were two passes to him. What would you bid in this situation? South was leery about leading away from his hearts, so he started with the ♠8, won by declarer's stiff ace. The ace and king of clubs were cashed, and King was pleased with the drop of the ♣QT giving him two entries to dummy in the club suit. He led to the ♣J (South pitching the ♠6) and tried to run the ♦9. North covered with the ♦10 and King won with the ♦J. He played his last club up to the dummy, South pitching a heart and North a spade. Then came the ♦4 to the ♦8 (both defenders following) and he stopped to take in the distributional information. Taking the only chance he could see, he led a low heart from his hand! South (who, remember, had AQJ9762) couldn't work out the position (the ♥A from him allows him to claim the rest of the tricks!) and played the ♥J. North had to win the trick and was endplayed into giving declarer two spade tricks or two diamond tricks. Declarer just lost two spades and two hearts for a scary +600. and was on lead after a long auction. RHO opened 1NT, LHO transferred to hearts and showed long clubs, and they had a power auction, cuebidding and keycarding into 6H. Mike's reasoning was such: They obviously have a ton of points, so the only tricks we have coming are in the trump suit. I might have two trump tricks, but a strong declarer will take a safety play, probably low to an intermediate card (T, 9, or 8) on the first round. So how do I make sure he doesn't do that? He led the deuce of clubs, trying to suggest a singleton. Declarer hastily cashed the ace and king of hearts and conceded one down. 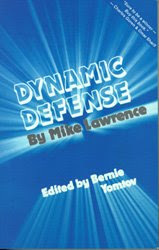 Dynamic Defense is a must-read for any improving player. I first read this book about six years ago when I was struggling to break out of Flight C. It helped teach me the right things to think about at the table. Hopefully it can do so for you too! Read this book, then reread it.